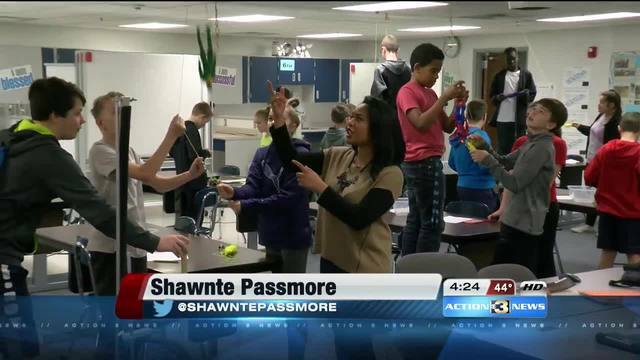 Throw out the textbooks and bring in the projects because at Lewis Central Middle School, you're building a rollercoaster inside Burke Swenson's STEM class. "We worked with energy, potential and kinetic energy and attain height - in other words when we drop it from one end of the track, how far back up is that going to come?” Burke Swenson said. The models need to mimic the real deal. The rubber is the track and the plastic, metal and wooden balls represent carts. "Making sure there's also momentum when you're going - through different places. That you don't fall off. Or experience too much G-force and then fall off,” said STEM class student Kaleb Brubidge. Students are sometimes either designing bungee jumps or roller coasters like right here - taking principles from science, technology, engineering and math. And programs like this are becoming the norm across the country. Before Swenson’s arrival, the middle school didn't have a stem class. It's not meant to replace math and science but compliments the subjects. "So my job is to find these projects and then we just make the kids work and apply it as advance as we can,” said Swenson. In Iowa, much like the rest of the nation, this trend is huge because of one thing. Statistics are telling us with the information they're putting out - that about 70 to 80 percent of future jobs are going to have some STEM principles in them,” Swenson added. The Hawkeye state even has a governor's STEM advisory council. Which recognized Swenson’s work in 2015.
if this program's success means anything, this ride isn't going anywhere.